The heat outside is almost too hard to handle, making it difficult to concentrate on anything other than praying for mercy in the form of an unexpected winter to break loose and rage on us all. “Turmoil”, unexpectedly, brings my wish one step, however small, into a glorious fulfillment with sounds that seem to have come straight from a dark and wintry night of coats and hats and gloves. Oh, the illusion can be healing! The high voltage that runs through the voice of Azia, who carries on her voice trails of punk, post punk and dark 80’s music along with a fresh flavor of a more modern angst, injects the entire music with powerful energy. We also have Jenn on guitar and programming and JRM on Bass, who creates great music, actually, that ranges between cold sounds and uncompromising, dramatic and energetic post punk music. Other influences are there as well, bringing to mind different band names as the songs progress, but the overall environment is that of an uncompromising (post) punk album and Les Modules Etranges do not stop to breath, not to mention to lower the pace for a nice ballad in the middle of the album. Instead they are heading straight on, and if the yare changing their speed, it’s just to make it faster. 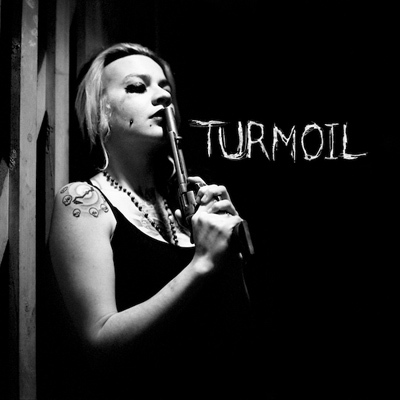 The lyrics of the “Turmoil” are nicely presented as a disturbing wall of insane writing. While this design matches the overall atmosphere of the album, I found it a little unfortunate that I could not really read the words, as I was very interested to see what the songs are exactly about. I hope I can find them over the internet, didn’t try to look for them yet, but the fact this is interesting works well and proves that this band had managed to move something in my head, even in this insane heat. And thanks for this cool review.